Human rights groups have condemned Nigeria for hosting Sudan's President Omar al-Bashir, and have demanded his arrest on genocide charges. Mr Bashir is attending a health summit convened by the African Union (AU) in the capital, Abuja. His visit was an "affront to victims" of the conflict in Darfur, rights groups said. The International Criminal Court (ICC) accuses him of committing genocide in Darfur, a charge he denies. The African Union decided in 2009, soon after the arrest warrant was issued, that member states should not enforce it. It accuses the ICC of complicating peace efforts in the region, and unfairly targeting Africans. 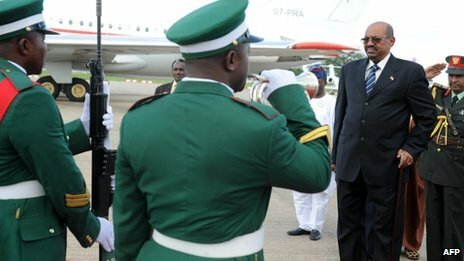 The BBC's Chris Ewokor in Abuja says Mr Bashir received a full guard of honour when he landed in Abuja on Sunday to attend the summit, which will focus on tackling malaria, HIV and tuberculosis in Africa. New York-based campaign group Human Rights Watch said Nigeria had the "shameful distinction" of being the first West African state to welcome Mr Bashir since the arrest warrant was issued. Its decision was an "affront to victims" of the Darfur conflict, it added. "He belongs in custody," said Elise Keppler at Human Rights Watch. Nigeria's government had breached its obligations under international law by inviting Mr Bashir, said Chino Obiagwu, chair of the Nigerian Coalition for the International Criminal Court (NCICC). "It sends a very wrong signal to other African countries that the International Criminal Court could be ignored... that African nations don't need to co-operate with the ICC and if that impression continues, then we're going to have serious problems dealing with impunity in Africa," he told the BBC's Focus on Africa programme. Some 2.7 million people have fled their homes since the conflict began in Darfur in 2003, and the UN says about 300,000 have died - mostly from disease. Sudan's government says the conflict has killed about 12,000 people and the number of dead has been exaggerated for political reasons. Mr Bashir has visited numerous African countries since the arrest warrant was issued - including Ethiopia, Kenya and Djibouti. Only Botswana and Malawi have threatened to arrest him. In May, the AU called on the ICC to drop war crimes charges against Kenya's President Uhuru Kenyatta after accusing it of "hunting" Africans because of their race. The ICC refused, saying it would press ahead with its case against Mr Kenyatta. He is accused of fuelling violence after Kenya's 2007 election - a charge he denies. Sudan said on Wednesday the Heglig oilfield, scene of intense fighting with South Sudan last month, has been repaired and has started pumping the oil that is the lifeblood of the north's economy. The two countries have been embroiled in weeks of fighting along their 1,800 km (1,200 mile) border, threatening to tip the region, which sits on one of Africa's most significant oil deposits, into a full-blown conflict. The United Nations Security Council approved a resolution that threatens both countries with sanctions if they do not stop fighting and resume negotiations within two weeks, as demanded by the African Union. China, which has close trade relations with both countries, and Russia supported the resolution after several days of negotiations with council members during which they resisted the Western push for a threat of sanctions. "The fighting must stop, and stop now," the U.S. Ambassador to the United Nations Susan Rice told the council. At the same time, Sudan said it agreed "in principle" with an African Union plan to end the crisis with the south. The AU demanded on April 24 that Sudan and South Sudan resume talks within two weeks, warning both it would issue its own binding rulings if they fail to strike deals on a series of disputes within three months. The AU has spearheaded mediation efforts between the two foes in the past with the backing of the United Nations, the United States and other major powers. South Sudan committed to the AU road map last month. South Sudan's army, the SPLA, said it killed 27 Sudanese army soldiers in a clash in Unity state on Tuesday. But despite the persistent clashes in the border region, the two countries have stopped short of all-out war, with their positions broadly the same as before the south seized Heglig. Sudan accused South Sudan of launching several attacks over the past week on its territory. It said the SPLA had occupied a border village in Bahr al-Arab as well as the disputed areas of Kafn Dubai and Kafya Kenji. South Sudan seized the contested Heglig oilfield last month before withdrawing shortly afterwards. The field is vital to Sudan's economy because it produced almost half of the country's output of 115,000 barrels per day. "This oilfield was producing 55,000 barrels per day," Sudanese Petroleum Minister Awad Ahmed al-Jaz said at the oilfield, accompanied by oil engineers and military officers. "Now as we said ... we plan to produce more than that, besides the production of other oilfields which will follow," he said, as he opened one the oil valves. Jaz said the oilfield had started pumping oil at 10 p.m. (1900 GMT) on Monday. He did not indicate how much Heglig was currently producing. "We can say the oil has now reached the Khartoum refinery." Sudan lost three-quarters of its output when South Sudan became independent in July last year. Both countries are at loggerheads over how much the southern landlocked nation should pay to export its crude through the north. The conflict has shut down nearly all oil production in the region, strangling both countries' oil-dependent economies. In January, South Sudan shut down its entire output of 350,000 bpd to stop Khartoum taking some oil for what it calls unpaid transit fees. Satellite images showed a key part of the oil infrastructure in Heglig was destroyed in the fighting. An earlier trip to Heglig showed damaged pipelines that were leaking oil. On Wednesday, reporters saw pipelines that had been repaired, but which still bore the effects of damage. Jaz said the power plant as well as rooms that manage the collecting, refining and storage of the oil had been damaged. "Those who came here and saw the damage said that the repairs could not be completed in six months," Jaz told reporters taken on an official trip to the oilfield. "Those who were optimistic suggested it would take four months to repair the damage. But the repair only took one week." Jaz said four foreigners, whom Khartoum said they arrested on Saturday for illegally entering Heglig and for being spies for the SPLA, had "participated in the destruction". The four, a Briton, South African, Norwegian and South Sudanese, are U.N.-affiliated workers. The United Nations rejected the accusations. "All four personnel were carrying out formal demining activities in Paryang, in Unity State," a spokeswoman for the U.N. mission in South Sudan, Josephine Guerro, said. Heglig is operated by Greater Nile Petroleum Operating Co (GNPOC), a consortium of Chinese, Malaysia, Indian and Sudanese companies. Parts of the border area around the Heglig field in Block 2 are still in dispute. South Sudan has agreed to an immediate end to hostilities in accordance with an African Union road map, which is meant to bring the former civil war foes back to the negotiating table. But fighting along the border has continued. The SPLA's spokesman, Philip Aguer, said the ground attack in Hofra on Tuesday, had later been accompanied by air strikes by a Sudanese Antonov and MiG-27 fighter jets. "The SPLA killed 27 SAF soldiers, including a major that was commanding the force," Aguer said on Wednesday. "(The SPLA) ... captured five trucks mounted with heavy machine guns. They fled towards Heglig." Sudan's army spokesman did not answer phone calls to verify the SPLA's claims. Limited access to the remote border areas make it difficult to verify the often contradictory statements from both sides. The newly independent nation of South Sudan has officially withdrawn its determined but insufficiently equipped military contingent on the disputed Heglig oil field and the aggressive Khartoum government to the north, The Islamic Republic of Sudan has declared victory. The Heglig oil field or Panthou oil field as South Sudan called it, is situated in the southern Sudan but the Islamic Sudan has laid hold of it even before South Sudan got her political independent and divorce from Sudan government last year July. Heglig or Panthou is an oil rich field that Sudan depended for its wellbeing and its economic significant to Sudan cannot be overemphasized. Reuters reported that the disputed landstrip “The Heglig field is the key to the Sudanese economy because it contributes almost half of the country's output of 115,000 bpd. Sudan lost three quarters of its output when South Sudan became independent in July last year. Both countries are locked in a row over how much the landlocked new nation should pay to export its crude through the north. " The Heglig oil field was operated by the Chinese as it was contracted to Chinese-led operator by Sudan government. The maximum output of 60,000 barrels per day was unaffected as South Sudan captured the peripheral of the oil field before its subsequent withdrawal. The Khartoum government of President Omar al-Bashir was energetic in its response to the temporary occupation of Heglig oil field. President Bashir's Sudan mobilized its relatively equipped military force and attacked military troops of South Sudan via land and air. Sudan government also engaged efficiently in a massive public relation strategy to bring the whole world on her side. And Sudan government this time succeeded in bringing the world to her version of its perspective and story on Heglig , this time around the world for the first time condemned South Sudan's President Salva Kiir. United Nations and African Union did not hold back in rebuking the actions of South Sudan. Even the United Nations secretary Ban Ki Moon went further with its condemnation and labeled the action of President Salva Kiir's South Sudan ‘illegal’. South Sudan withdrawal can be strategic in the sense that it has alerted the global village that its claim on the disputed oil field has not ceased. The critical issue is that the enmity between North and South has not diminished even with southern independent. South Sudan has the burden that history laid on her shoulder; the land and the people has been deprived with poverty, humiliation and undeniable oppression from the Islamic Sudan government. Now the South Sudan is in the position to assert her independent and dignity. South Sudan since divorce from the north has never shy away from registering its past grievances through peaceful or otherwise. The diplomatic breakthrough enjoyed by South Sudan was achieve by negotiations and settlements through part by fighting and sitting on the table. Therefore South Sudan do have a clear agenda for her actions, but she should adhered to established norms and standard for attainable of peace. Bashir's Sudan and South Sudan'sKiir should recognized that military confrontation cannot be the only channel for dispute settlement but through a less destructive path of peaceful negotiation and comprehensive conflict resolution. BBC reported that "Mr. Kiir said the South still believed that Heglig was a part of South Sudan and that its final status should be determined by international arbitration, Associated Press reported. Heglig is internationally accepted to be part of Sudanese territory - although the precise border is yet to be demarcated. The UK minister for Africa welcomed the news of the withdrawal and urged restraint on both sides." President Obama and his administration did a good job in seeing to the implementation of the verses of Sudanese accord and subsequent South Sudan independent. President Obama reiterating of peaceful negotiation for the both parties must be enhanced with urgency and effective backup by United States. President Obama was in the right direction as he called for negotiated peace on the land. His words “We know what needs to happen -- the government of Sudan must stop its military actions, including aerial bombardments," Obama said. 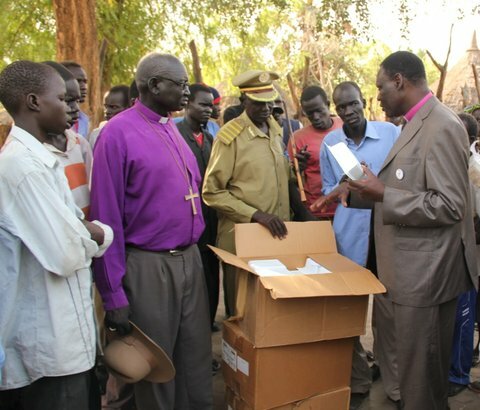 "Likewise, the government of South Sudan must end its support for armed groups inside Sudan and it must cease its military actions across the border." Bashir‘s government must be made to understand that more violence begets more violence and everybody will become a loser. As an elder statesman in Africa, he must be gradual and easy on force and continue to exhibit the path he took for the South Sudan to realize its nationhood. At same hand the South Sudan with its heavy heart rooted on history of depravity and destruction should exercise patient and show some goodwill by allowing peaceful negotiation to be the pathway to a peaceful and mutual recognized outcome. The world must acknowledged the burden of history that was laid on the new independent nation of South Sudan and should be fair on its approach not by throwing raucous and overreaching condemnation when South Sudan stands up for her right. Quite diplomacy and logical appeasement may deem inevitable and necessary when dealing with a new nation that is struggling to stand on her own. Sudan as a nation has never known peace since her independent from Britain in 1956. There were always inter or intra tribal conflicts, regional division, ideological fragmentations and religious conflagration. There were two protracted civil wars and Darfur conflict that resulted into genocide. These intractable problems have never gone away and the constancy of these problems has disorganized the largest land mass country in Africa. Sudan is endowed with natural resources notably crude oil but massive poverty, diseases and wars have become the landmark of the troubled land. At this moment emerges a window of opportunity from the notably Peace Accord made between the Islamic North and mostly Christian South that called for a referendum in January for the self-determination of the South. This opportunity to end the wars, genocide and abhorrent status quo in Sudan cannot be allowed to flatter away. The Bush administration must be acknowledged for their contribution to the advancing of peace making between the warring factions in Sudan that culminated to the Peace Accord, subsequently with the scheduled forthcoming independent referendum in January. The Obama administration and United Nations must utilize all the leverage they can muster to make sure that the Sudanese government of President Omar al-Bashir do not back down from the timetable and the implementation of the accord. Earlier, President al-Bashir was indicted by International Criminal Court at Hague for war crime in the Darfur genocide. Although President al-Bashir has assented that he will abide by the outcome of the referendum which will surely result to the secession of the Southern Sudan but the watchful eye of the world is still necessary. United Nations must make the necessary arrangement to ensure that the outcome of the referendum will be honored in orderly framework. The presidential candidate Barrack Obama was talking up the issue of Sudan during his campaign for presidency and was showing all the signs of being on top of it once he got elected. The critics of Obama administration including Human Rights organizations and some members of US congress were complaining that his policy on Sudan is murky and that may be unfounded. President Obama administration is backing the independent referendum which he reiterated America’s support during his appearance at the United Nations conference in September. President Obama said, "The stakes are enormous, we all know the terrible price paid by the Sudanese people the last time north and south were engulfed in war -- some 2 million people killed." The United Nations General Assembly cannot afford to be playing child’s picnic with the issue of Sudan because the downside will be a horrible ramification that will quadrupled human sufferings that comes with massive loss of lives, property destruction and with unspoken tolls of hardship. United Nations has to put more resources and energy by aiding African Union and listening to the counsel of Nigeria’s Professor Gambari, United Nations Special envoy to the Arab League Summit that he is offering in order for the cessation of the violence to be sustainable. African Union (AU) can be of great help because Sudan is in their turf but AU lacks the necessary fund, resources and logistic to implement the accord singlehanded. Khartoum government may likely back down from the accord without any credible power breathing down over their back. Bashir government has every reason to withdraw from the peace accord because the oil resource is in the south. Therefore the United States and United Nations can bring firmness on the issue that will not provide the Khartoum incentive to be become reluctant to implement the accord. This is not the time to appease tyrants and dictators who are not willing to work together with global community to foster tranquility and peace in their corner of the world. As Sudan is aspiring to be a democratic nation and a responsible nation she will follow up with the peace accord and avert further destruction of her land. President Bashir has to display a statesmanship with responsibility that will convince the peace loving people of our globe that his quest for peace and unity is without doubt. Peace can be made self-evident not by words and promises but action and commitment to peace. The world community must be willing to work with the Sudanese government to bring to an end the wars and disease in the land. At the end of the day if the South ratified the referendum by voting Yes, then their self-determination will be honored and respected. And that will mark a new chapter in the annals of peace making and a new dawn of peace will commence in the troubled land of Sudan. In 21st century Africa, peace is a precious resource and Africa must be willing to do anything within her power to maintain a peaceful continent. The greatest bearer of brunt of African wars, instability and dilemma are women and children. The children of Africa and Sudan must be protected from wars, diseases and abuses emitted by their selfish leaders and war lords who were bent on implementing ideas and policies that do not promote peace, liberty and unity in the political landscape.